Florida, which falls between USDA hardiness zones 8 and 11, has short, mild winters and hot summers. Most deciduous fruits do not grow well in Florida because they require a winter chilling period to set fruit. Blueberries, however, are one deciduous fruit that has adapted well to Florida’s climate. The University of Florida has even developed a series of hybrid cultivars that thrive in the state's mild winters. 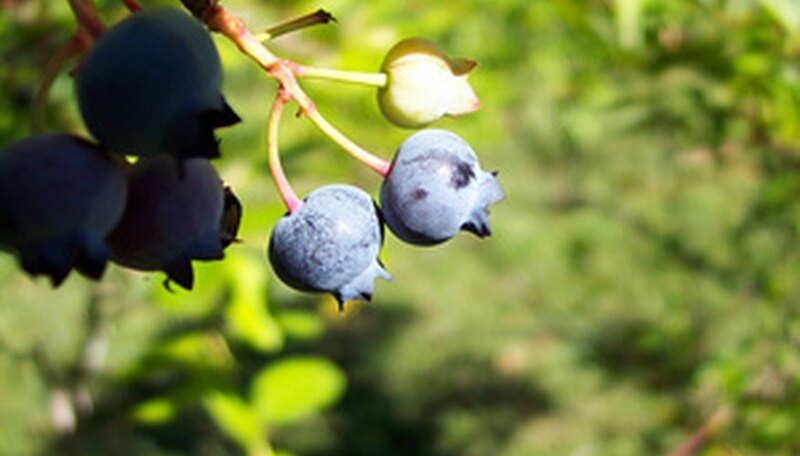 Select a location for blueberries in full sun with well-draining soil. Because blueberries can rot in areas where the water table is less than a foot underground, grow the plants in containers or raised beds. Test your soil before planting. Blueberries need to grow in soil with a high organic content with pH between 4.0 and 5.0. A soil test can help you determine what amendments to add. You can submit a soil test to the University of Florida through the county extension service. Break up the soil to a depth of 8 inches. Spread soil amendments in a 4-inch layer over the surface of the soil. The best amendments for blueberries in Florida soil include peat moss, pine bark, pine straw, pine sawdust, compost and sulfur to lower pH. Mix these amendments into the soil with your rototiller. Time the planting of blueberries from mid-December to mid-February in Florida. Select bare root or container-grown berry varieties for planting. Dig a planting hole in your soil twice as wide as the root ball and deep enough so the root ball is 4 inches deep. Mound up soil in the middle of the planting hole to cradle the roots. Space each planting hole 4 feet apart. Soak the root ball of your blueberry bushes until the roots become saturated. Gently rinse the roots to wash away soil in the roots. Spread the roots over the soil mound and pack soil around the roots. Cover the planting with 4 inches of pine bark mulch in a ring 2 feet out from each plant. Check the plantings weekly and water often enough to keep the soil as wet as a wrung-out sponge.